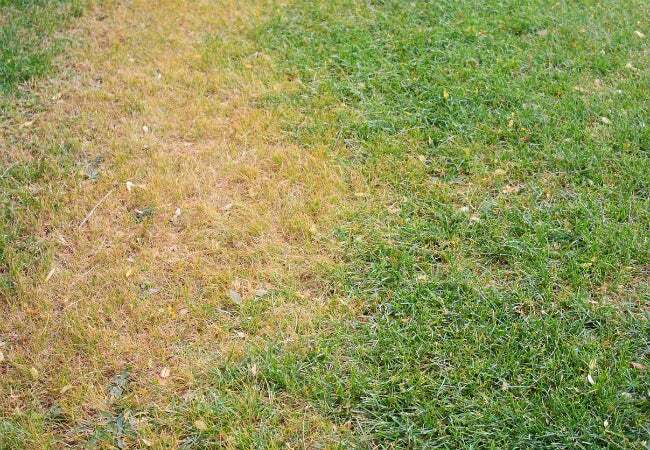 Patchy, brown grass is one of many signs that can point to a lawn fungus. Get to know what else to look for—and how to treat each—with this guide. Q: My lawn was so lush and green last year but this year it’s full of unsightly brown patches that won’t green up no matter how much I water my yard. How can I get rid of the patches and get my beautiful lawn back? A: It sounds as if you might have a case of the lawn fungus known as “brown patch” on your hands. It’s just one of a number of fungal diseases that can wreak havoc on turf grass. Other types may appear as rings of mushrooms, streaks in the lawn, slimy areas, spots on individual leaf blades, discoloration, or powdery blotches. Keep in mind that your lawn is a living entity, and it naturally contains millions of fungi spores, most of which will never cause problems. 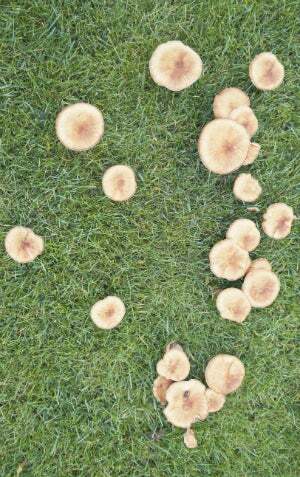 Under adverse circumstances, however, such as long rainy seasons, droughts, overwatering, and substandard lawn care, fungi can spread out of control, leaving you with a blighted lawn. The good news is that you can treat many cases of lawn fungus—and prevent future cases—just by following good lawn care practices. And, for particularly stubborn cases, you may find a solution via the application of a topical fungicide. Water your lawn early in the day. Healthy lawns need approximately an inch of water weekly, but the sooner the grass dries up after watering, the less chance it has of developing lawn fungus. By watering early in the morning, your lawn has the entire day to dry. Sharpen your mower blades. Dull mower blades tear off the tops of the grass leaves instead of cutting them. Ragged, frayed blades of grass are more susceptible to developing fungal disease than those with sharp, clean cuts. Mower blades should be sharpened in the spring before the mowing season starts. If you have a large lawn, you may want to sharpen your mower blades a second time during the summer. Remove no more than one-third of the grass height when mowing. Cutting away more of the grass stresses and weakens it, increasing the risk of a fungal disease. Fescue, the most common turf grass, should be mowed approximately 3.5 inches high. Bermuda grass does well if mowed at 2 inches high, and zoysia grass at 2.5 to 3 inches high. Removing no more than one-third of the grass may mean mowing more frequently during times of quick growth, but it will help keep your lawn healthy, and a healthy lawn is a strong deterrent to lawn fungus. Don’t over- or under-fertilize. If your grass doesn’t have the nutrients it needs, it won’t develop a strong root and leaf system, but if you apply too much fertilizer, you will encourage rapid blade growth that the roots cannot support. Both are mistakes that stress the grass and increase the risk of disease. Choose a fertilizer for your specific type of turf grass (fescue, Bermuda, etc.) and use a fertilizing applicator that you can regulate to dispense the exact amount of product recommended by the fertilizer manufacturer. Dethatch to remove dead grass. Over time, dead grass can build up at the soil level, choking out healthy grass blades and increasing the risk of lawn fungus. Dethatching is the process of removing the dead grass, which can be done manually by raking it away with a special dethatching rake. It’s a time-consuming process, however, and if your yard is large, you may want to rent a power dethatching rake from a lawn-and-garden center. Dethatching attachments are also available for some types of riding mowers. Aerate your yard to loosen compacted soil. Compacted soil can result from heavy clay content or from driving over your yard, which can compress the soil. The condensed soil restricts healthy grass development and reduces drainage, both of which can lead to the growth of lawn fungus. The simplest option is to hire a landscape company to aerate your yard, but if you’re DIY-inclined, you can rent a powered aerator from a landscape center and get to work. Aerating removes small plugs of soil, loosening the ground, and increasing circulation around grass roots. Lawns with soil heavy in clay will benefit from annual aeration, while other lawns should be aerated once every two to four years to maintain optimum health. Check and amend your soil. Most types of turf grass grow the best in well-drained soil with a pH level between 6 and 7. To ensure that your grass has the correct nutrients and pH level, take a soil sample to your local Extension Office. The Cooperative Extension Service (CES) is a branch of the USDA that works in conjunction with state universities to research and advise citizens on the best agricultural practices in their regions. On the CES website, you can locate the Extension Office in your county. They will test your soil sample and give you explicit details about what type of soil amendments are necessary in order to make your lawn healthier. This service usually runs less than $20. Apply a fungicide. If the preceding steps do not eradicate your lawn fungus problem, you may need to apply a topical fungicide. A broad-spectrum fungicide product will treat many types of fungus, but for the best results, take a sample of the diseased turf grass to an Extension Office, mentioned above, and request that the sample be tested to pinpoint the exact fungus that is causing the problem. You’ll receive detailed information that identifies the fungus and recommends the best type of fungicide for treating it.